We’re a few weeks into the semester Tar Heels and that means you may have settled into a routine: found your favorite fitness class, scoped out the best place to study and make a bee-line to the veggies in the café before filling up on other foods. Or you may be a little overwhelmed: classes are starting to pile on more work, there is little time to balance socializing AND sleeping and you have found the 24-hour Wendy’s to just be too darn convenient. Whether you are on a roll or are feeling crazed, or you fluctuate day to day, know that there are at least a thousand other students like you going through the same ups and downs. Including me! So let’s try this together. Here are seven steps you can take to make your life a little more balanced along with resources on campus that can help you get there. Maybe you have already checked some of these off and in that case, you can be pretty proud of yourself! I myself will be trying to get more sleep for the rest of the semester. What steps are you going to take towards a healthier you? Eat Healthy Try filling half of your plate with fruits and vegetables at every meal. This will help you towards a more balanced diet. Would you like to talk through a more tailored nutrition plan? 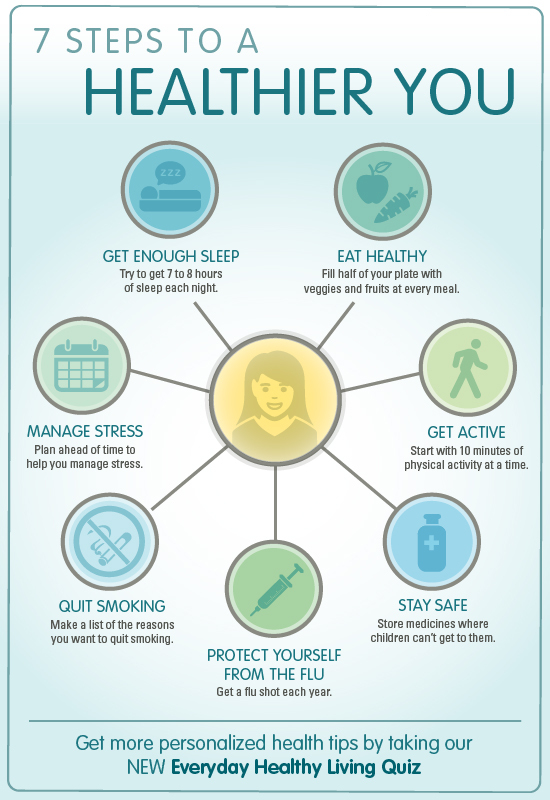 Call Campus Health Services at 919-966-2281 to make an appointment for nutrition counseling. Get Active Start with 10 minutes of physical activity at a time. This may not seem like much, but every minute counts. And remember, working out doesn’t have to be a chore. Find an exercise you like, such as swimming or bike riding. Or meet someone new at a fun fitness event at Campus Recreation. Stay Safe Whether you live in a dorm room or an apartment, store your medications in a safe place where others will not be tempted by them. Your medicine was purchased or prescribed for your symptoms only. Have old medications that you don’t use or have passed the expiration date? Bring them to Campus Health Pharmacy to dispose of safely! Protect Yourself From the Flu The fall is upon us and soon everyone will be sniffling and sneezing their way into winter. The flu is one trend you don’t want to be a part of. Campus Health Services will be administering flu vaccinations (FREE with student health insurance) at drop-in clinics, the pharmacy, or call 919-966-2281 for an appointment. Quit Smoking Make a list of the reasons why you should quit. Seeing these reasons laid out is an incentive for many smokers. And remember if you don’t make it the first try, each quit attempt is practice for the time when you do quit for good. Both Campus Health physicians and Counseling and Psychological Services (CAPS) can provide prescriptions to help quit or provide behavioral modifications. To make a CAPS appointment, call 919-966-3658. The Healthy Heels Shoppe also sells cessation aids, such as nicotine gum, lozenges, and patches, with pharmacists available to walk you through your options. Manage Stress Plan ahead of time to manage your stress levels. Whether for you that means keeping a daily list of to dos, a color coded calendar, or getting your bag organized with all the notebooks and readings you need the night before, find what helps you. If you need someone to talk through some of your stressors, call CAPS at 919-966-3658. Get Enough Sleep Try to get 7-8 hours of sleep a night. Going to bed even 15 minutes earlier and doing something you enjoy such as reading for pleasure or even deep breathing will help relax you to sleep. Try to put all electronics away half an hour before you go to bed so your brain can wind down. (Also, don’t discount the power of napping!) Need to speak with someone about your trouble sleeping? Make an appointment with a Campus Health Services doctor at 919-966-2281 or a CAPS counselor at 919-966-3658 to help you get a better night’s rest. For more advice making small changes to achieve a healthier you take this Everyday Healthy Living Quiz. *Some content for this post was taken from Healthfinder.gov, a website of the U.S. Department of Health and Human Services.